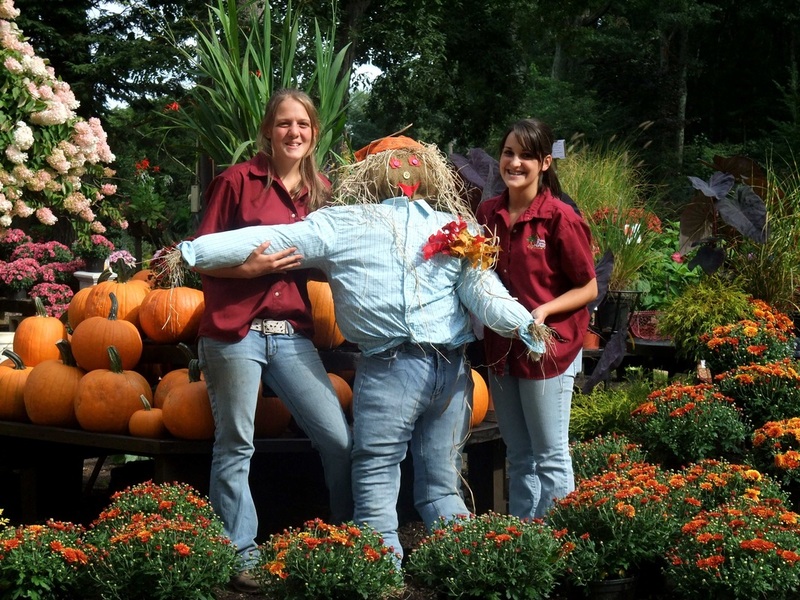 We can't be prouder of the selection of fall planting parties you have to choose from this season. Bart, Amelia and Tina all brainstormed to pick the very best of the past, along with some really, cool new ideas. There are amazing porch pots, of course, but you can also make a living wreath, two dried wreaths, a stone ghost and a whole lot of whimsical creations. If you take some time for yourself, we guaranteed to make you smile. 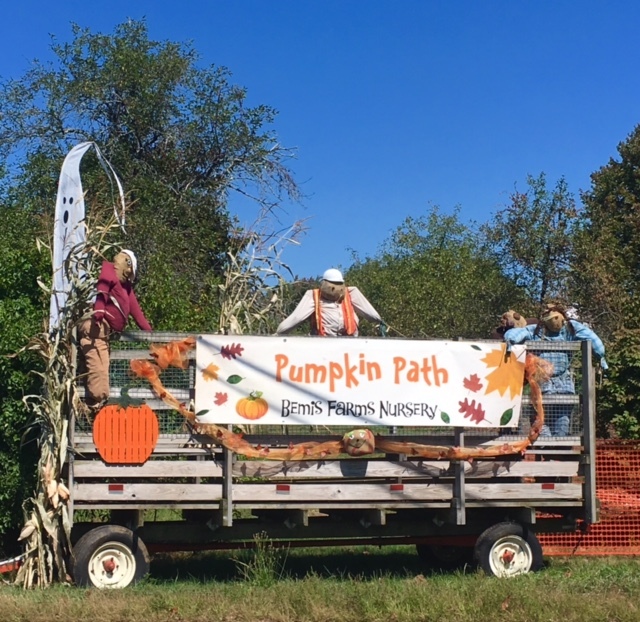 In addition to our annual "Scarecrows for Solutions" fundraiser, we have a brand-new Pumpkin Path! It's a magical place for children and adults to take a break from screen time and experience the harvests of nature. We have also resurrected our famous Gourd Hunt! For a modest fee, it now includes a trip through the pumpkin path, making a mini totem pole and concludes with a twilight walk through the Lighted Jack-O-Lantern path. Come in your costume! Scroll down for more details on all of our fall activities. 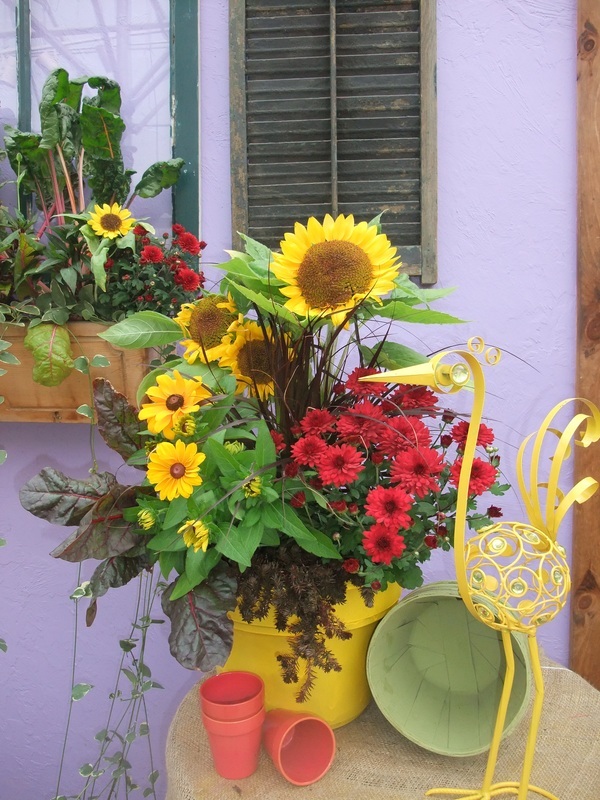 Combine the warm colors of summer into this cheery pot that is sure to bring a smile to everyone that passes by. It first starts blooming in late summer with sunflowers and dwarf black-Susan’s, then progresses into the fall with colorful mums, surrounded by contrasting grasses and foliage plants. 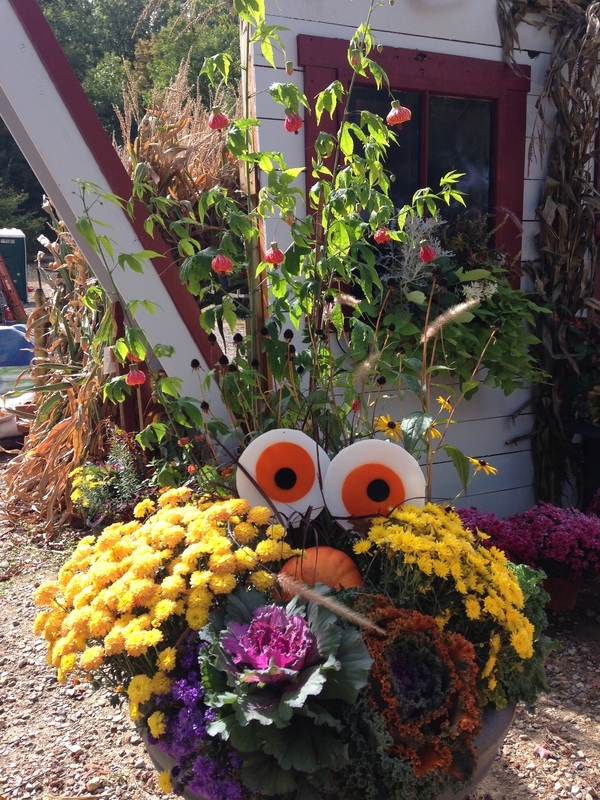 Bart created a bunch of spooky/googly eyes last year for decorating around the nursery, and everybody wanted to buy them! 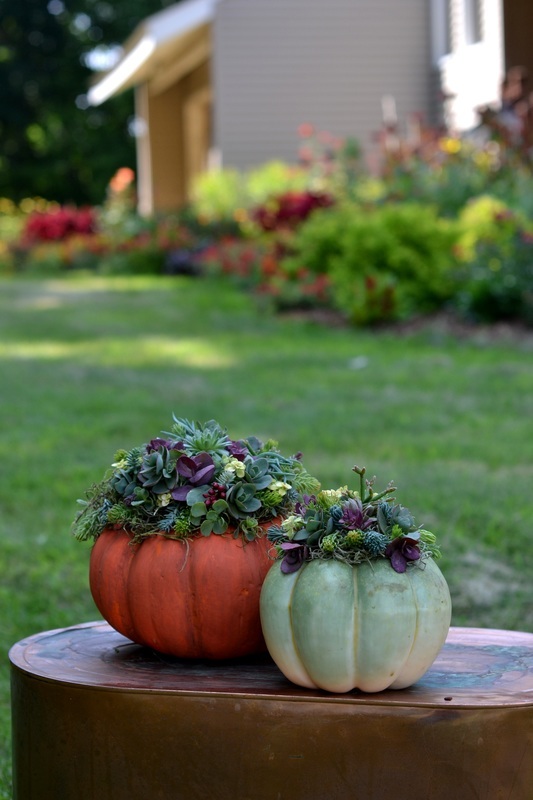 So we created this workshop that infuses a little whimsy into a pot of traditional fall plants. Here's the other side of Bart: serious designer. 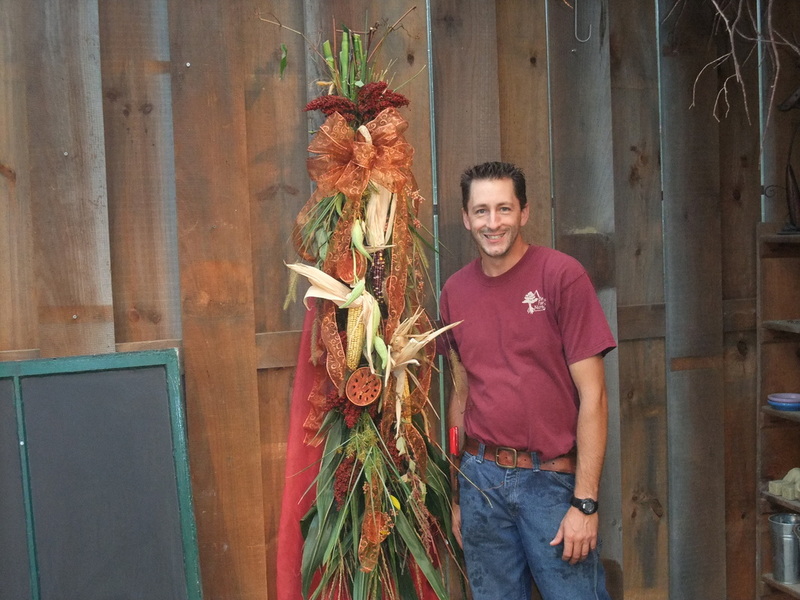 Join him to create a whole-door swag of corn stalks, dried fruits and grains, and other harvest items, and top it all off with a great big bow. This can be hung both inside or outside. 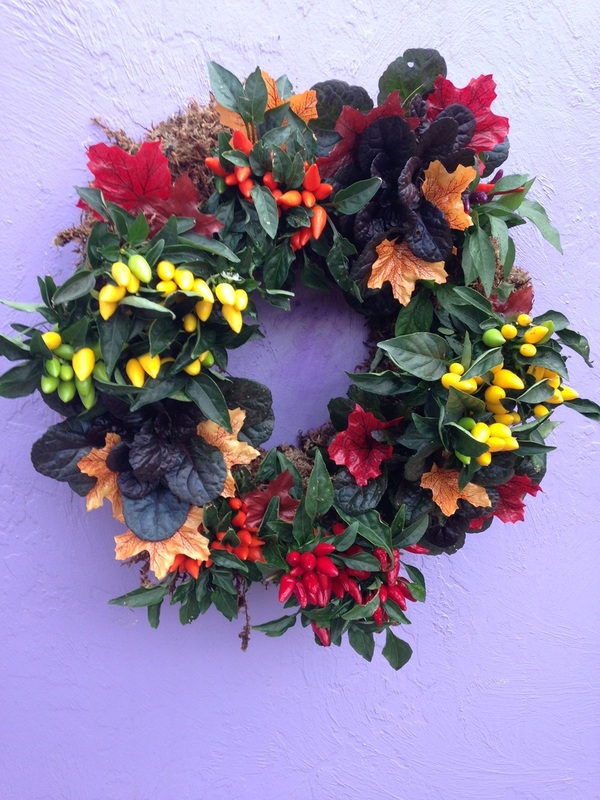 Enjoy this 16 inch living wreath, stuffed to the edges with ornamental peppers and dark chocolate ajuga. Eat one if you dare!!! They are very hot. If you bring it inside on frosty nights, it will last all through October. You can even save the perennial ajuga and plant it in your garden for next year. This class is for the person who has taken a whole bunch of our classes already and wants something different! Last year Tina and Bart created this pot with a brand new plant called Coral Snowberry. So Tina planted 45 of them this spring, and we have been growing them all summer specifically for this class. Coralberry is a hardy shrub, so when the season is over, dig a hole and add it to your collection of unusual plants you love. It's a real conversation starter! 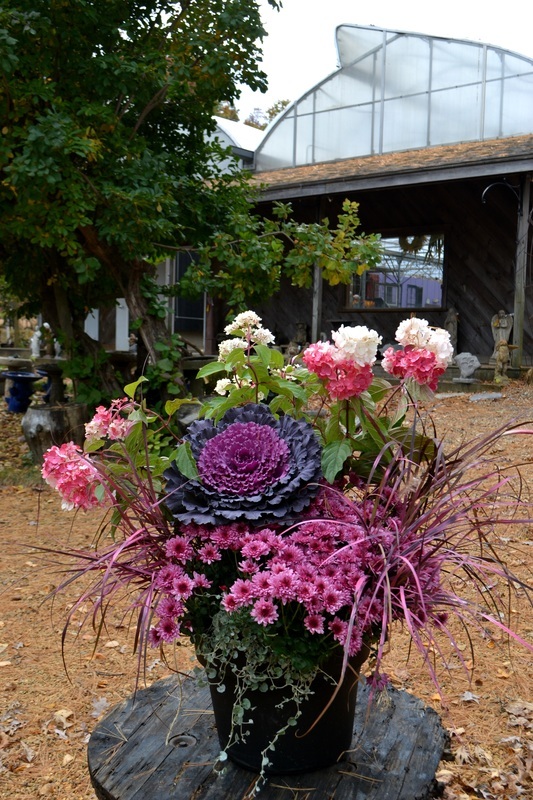 You’ve seen those funny-looking “colored cabbages” and maybe wondered what to do with them. 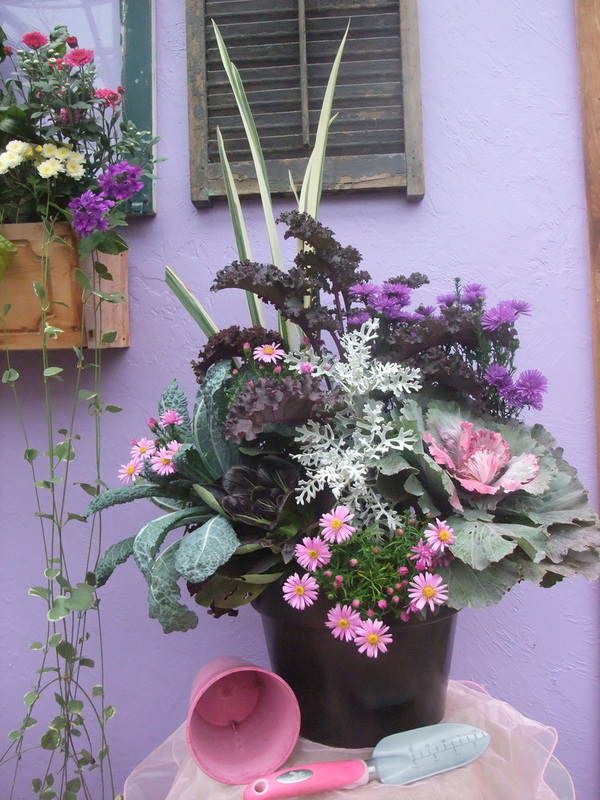 Mix them with perennials and more for a pot that’s anything but boring! Each day new flowers or leaves unfold & grow into a kaleidoscope of interest until the holidays roll around. I don't know how many people sent me this picture last fall. It was all over Pinterest! You will assemble this during class, but disassemble it to get it home. Best when placed where the wind won't tip it over, or put a stake in the ground behind it for additional support. Take a stroll thru a magical place on a classic, New England field, where pumpkins grow on trees, and houses (pyramids, too!) 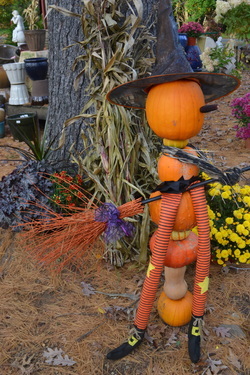 are mage of gourds and other harvest fruits. Back by popular demand! This upscale way of decorating a pumpkin continues to make the rounds all over Pinterest. Hot glue a selection of succulent cuttings onto our secret base that slips over the stem of your choice of pumpkin. These will easily last inside or outside until Halloween. Then bring them inside and pop the tops in a pot where they will continue to root in and grow all winter. 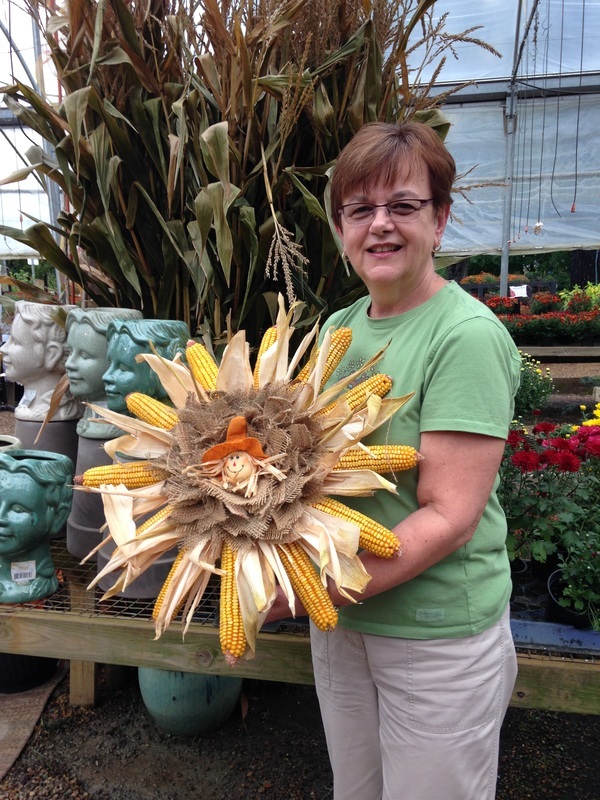 Next spring, tuck it into your sunny garden, or split them up and plant them all around. Everyone always loves this wreath, but until now, it has been tricky trying to teach beginners how to make it. We have it perfected to make it easy and fun. The corn is harvested on a farm in Spencer, keeping open space right here in Central Massachusetts. An armful of freshly-picked Pee Gee hydrangeas goes into each wreath. The cream, mauve, and chartreuse flowers are picked on the exact perfect day so that they may dry on your wreath and hold their color for several years. We've nurtured a bumper crop of hydrangeas this year, so we have lowered the price of this class! This is, by far, the easiest craft class of the year. You can practically make it with your eyes closed. Simply attach freshly harvested clusters of locally grown, chemical free , Pee Gee hydrangeas onto a ribbon-covered straw frame. 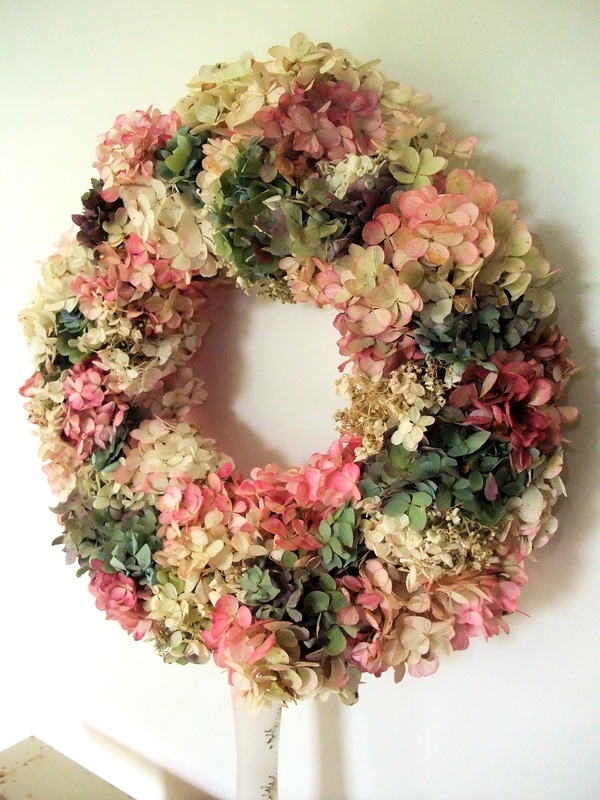 The simple elegance of this wreath will compliment many varying styles of home décor, from Country to Contemporary. This wreath will dry on your wall, and last for several years. When you get tired of it, spray it gold for the holidays. 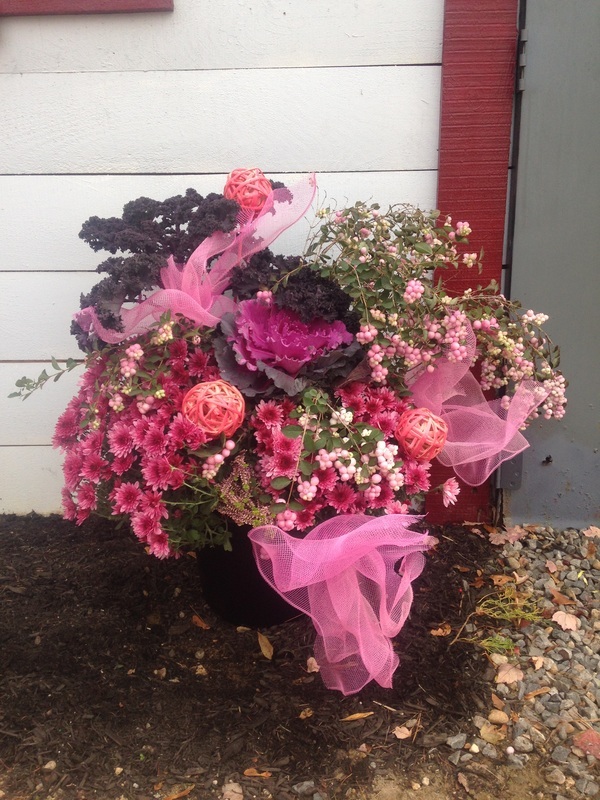 Create this Traffic-Stopping container garden featuring, mums, kale, grasses, and a living hydrangea bush- the brand new variety called 'Strawberry Sundae'. Or choose from 6 other hydrangea varieties! At season's end, slip it into the ground, and as early as next year, you will be able to harvest your own flowers to refresh or make new wreaths for years to come. If you sign up for this class and the hydrangea wreath class before it, you get to make a matching hydrangea swag for free. Concrete Zombie heads and hands will be ready and waiting for you to paint. 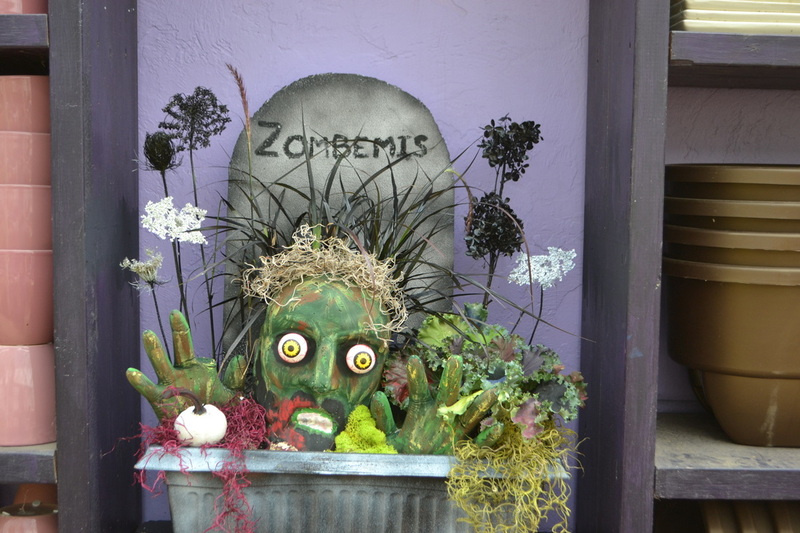 As the paint dries, create your own tombstone and epitaph, then design your pot with living "dead" flowers and color-enhance dried flowers. 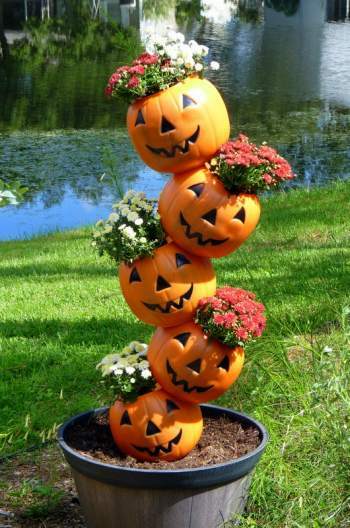 If you get into decorating for Halloween, this is a must have! Next spring, you can repaint the hands and plant then with some thyme. Because everybody could use a little more Thyme on their hands. Tina joined a Hypertufa Facebook page, and this is one of the amazing things that people across the country are creating with this cement-like mixture. Everything is included in the class, just make sure you wear old clothes, and bring a pair of dish-washing gloves. It will harden for a few days at the nursery, then you can pick it up anytime. 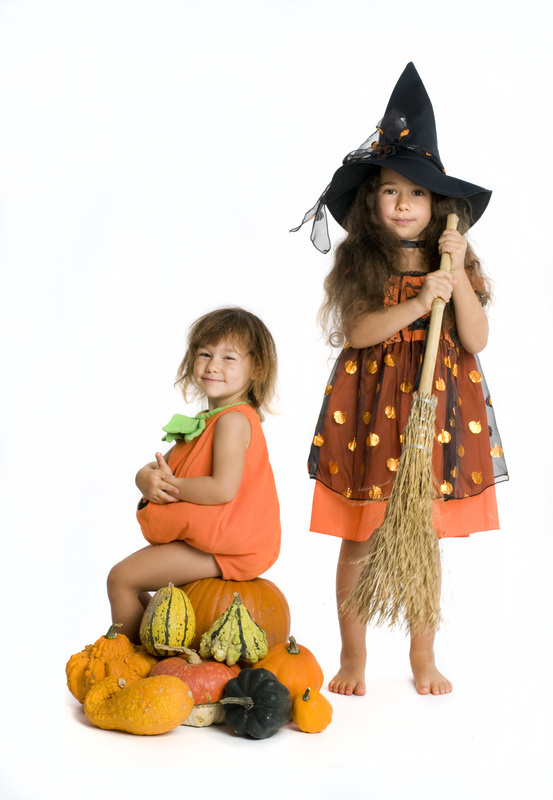 Wear your costume and play games while you hunt an armful of gourds along the Pumkin Path. Snap a photo with The Great Pumpkin Man. 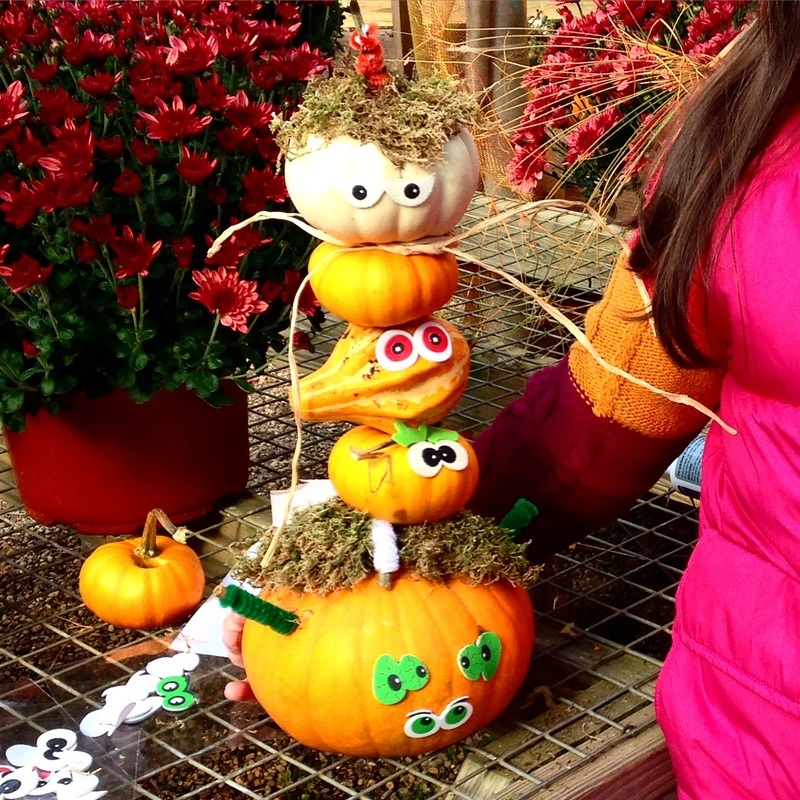 Then use your gourds and a sugar pumpkin to create and decorate a mini pumpkin Totem Pole. Finish at Dusk with a walk among the new Field Of Lighted Jack-o-Lanterns. We have a new wire frame to build this on, so it will be easier to transport and set up back home. 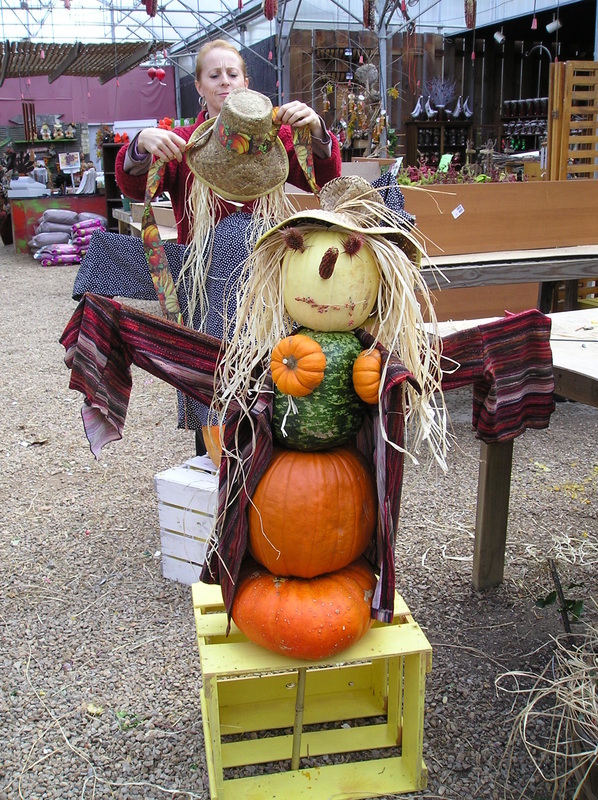 Drill holes in a selection of pumpkins, gourds, and squash and decorate with fun and whimsy. Then show it off to all the little devils who show up for candy on Halloween. The cooler it is, the longer it will last! Being an adult is over rated. Why do the kids have all of the fun? Feel free to bring your favorite kids, but this class requires some strength, so is geared more towards the child in all of us. Assembled here, but taken apart to fit into your car, this will turn all the heads in your neighborhood. On Halloween, everyone will think you are so clever! 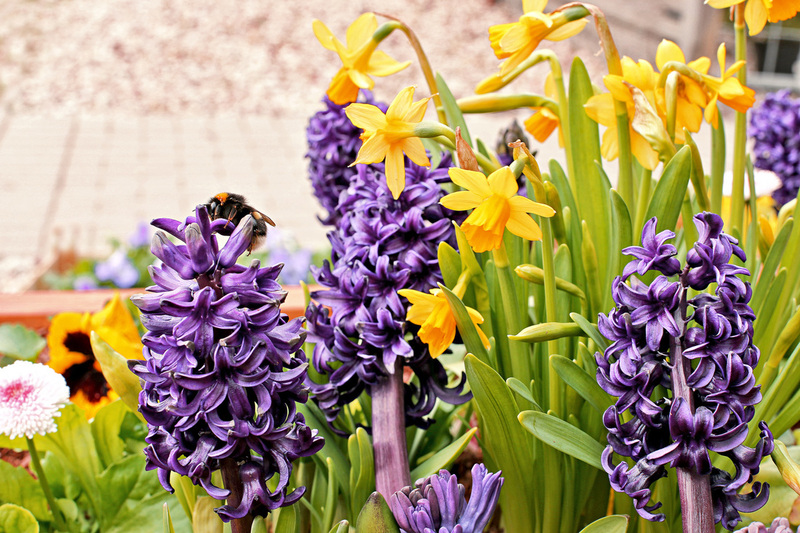 You won’t believe how many daffodils, mini daffs, hyacinths and Muscari you fit in when you plant in layers. Simply leave it here where we “trick” it into thinking it is winter, a 14 week process needed for them to bloom. Pick it up in February, and enjoy a month of flowers at a time when you truly think winter will never end.